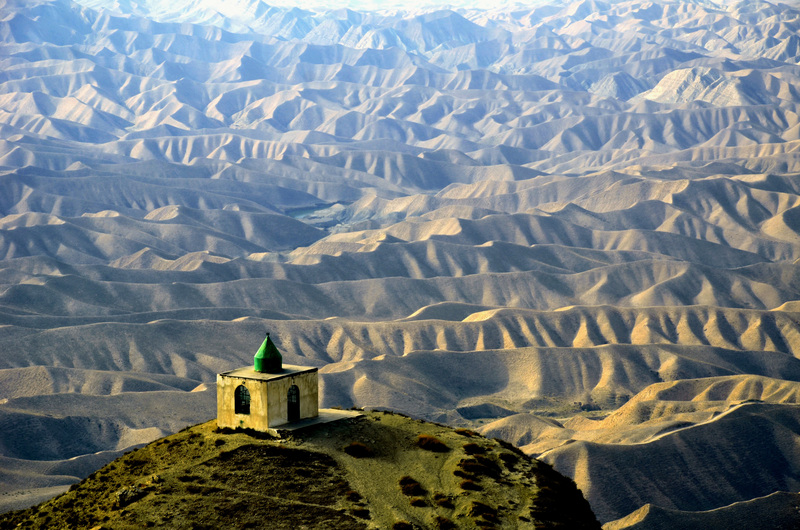 Tomb of Khaled Nabi located in southeast of Gonbad-e Kavoos on the top of a mountain called Kooh-e Khoda (The Mountain of God) between Kalaleh and Maraveh Tappeh. Khaled-e Nabi Tomb has a very special landscapes. Local peoples believe that one and the prophets (Khalid) buried in there and built three tombs for him two other of his followers and there are became a pilgrim place for Iranians. It is located in Golestan province near the border with Turkmenistan. 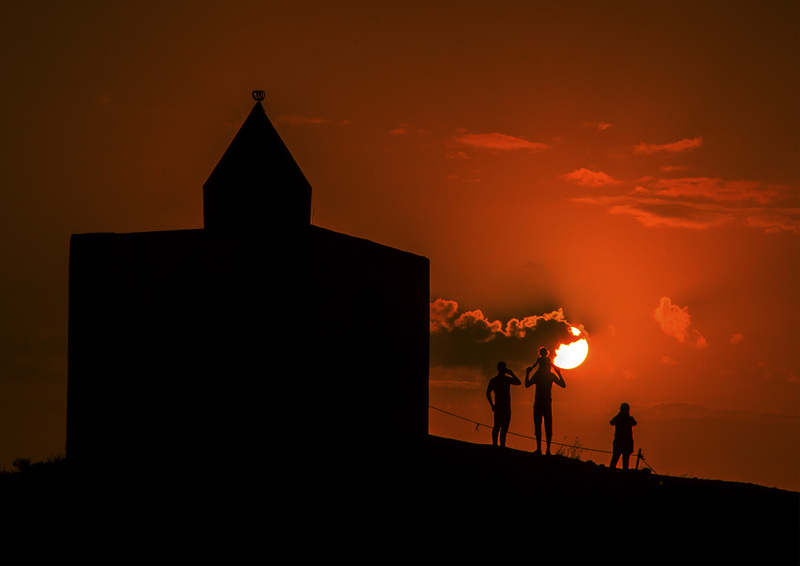 It is mainly situated on a mountain ridge about 1 km distance from the mausoleum called “Khaled Nabi” who according to oral tradition of the Yomut Turkomans was a pre-Islamic prophet and whose mausoleum is visited by them for pilgrimage together with the neighboring one of Ata Chofun (Father Shepherd), his son-in-law. Magical site in a infinite​ horizon of Green hills. There is a mausoleum but the main draw are the falus and butterfly shaped tombs a couple hundreds meters walk from the parking. The second attraction is the location with a landscape of infinite green hill. Beautiful place for sunset and sunrise. 30’000 rial per car. You can sleep on the parking (the one right at the very top is best). Avoid week-ends. The drive from Tamar is beautiful and paved until the last 6km which is a bumpy pebble/gravel road. The existence of this personality’s tomb in the heart of the region and close to other tourist and historical sites attracts a good number of Iranian and foreign tourists. This site is 90 km northeast of Gonbad-e Kavous and 6 km from the village of Gatchi Sou. In addition, the building of the tomb of Khaled Nabi, which is surrounded by the surrounding mountains including Mount Djordjan, is located at the top of Mount Tangri Dagh. It is a small humble building whose architecture is simple and without artifice. A little further on, on a neighboring summit, is another small brick building housing the tomb of an unknown saint named Tchoupan Ata (the Shepherd Ata) and that of Alem Baba, Khaled Nabi’s father-in-law. According to the historical texts, it is likely that Tchoupan Ata was the shepherd or one of the faithful of Khaled Nabi. The main facade of the two buildings consists of three windows and a door with segmental arch arches above the windows and doors; the whole being capped with a metal dome. The summit of Tangri Dagh offers a panoramic view of an extraordinary site known as Hezar Darreh (The Thousand Valleys) or Pandj Shir (Five Lions). This vast expanse comprises a group of hills naturally arranged next to each other, like waves. 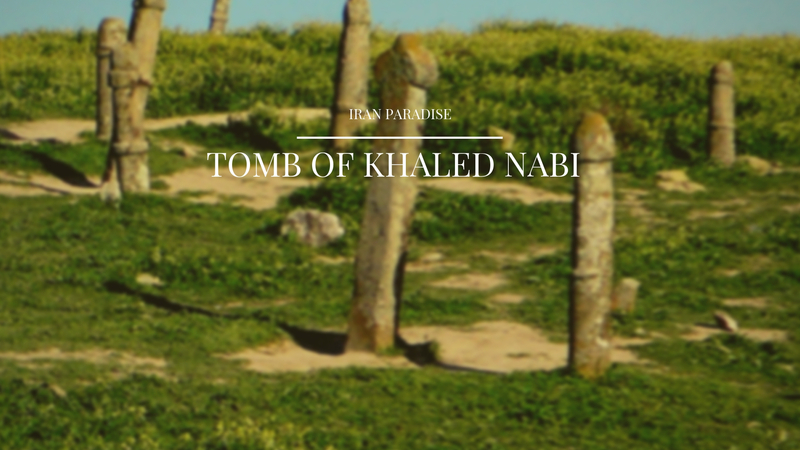 The northeastern part of Khaled Nabi’s tomb overlooks a relatively large field where many stone columns have been erected. The surrounding mountains of the region would have provided the stone of said columns. According to the researchers, these monuments, whose number reaches 600, are in fact tombstones built in the form of columns one to five meters high and 50 cm thick. These tombstones carry no information and therefore remain unidentified. However, according to archaeological studies, the history of the cemetery dates back to the year 630. 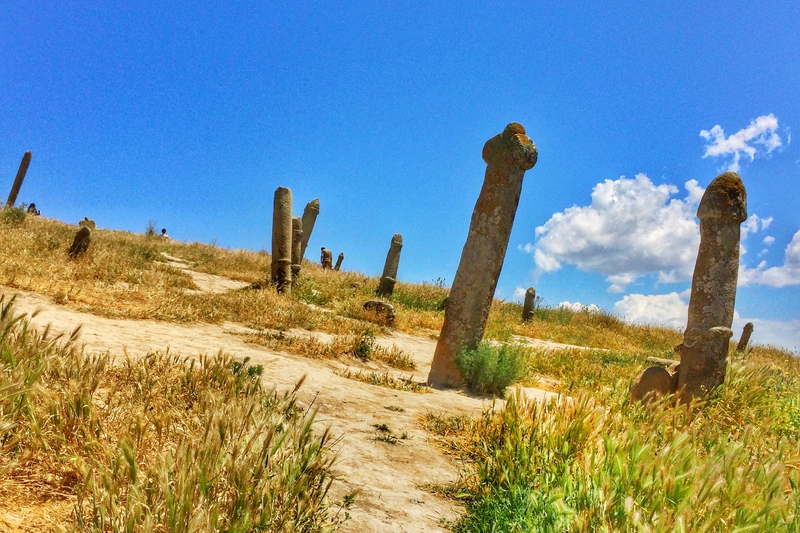 According to the classification of archaeologist Alira Hessar Nouri, the gravestones of the cemetery are of three types: 1) stone columns measuring five meters high and erect vertically. The outer part of each column is carved in the shape of a candle while the end takes the form of a helmet. According to a common assumption, this type of gravestone would be the mark of male graves; 2) the shorter columns (from 60 cm to four meters) carved in the shape of a cross, which evoke the appearance of a man who remained standing, hands on hips. It would be, according to the hypothesis mentioned above, of funerary stones adorning female graves; 3) few, we also find stones engraved in the shape of a ram; according to the Turkmen tradition, the ram is the symbol of bravery and power. Other nearby natural and religious attractions include the blessed tree (derakht-e nazarkardeh), the healing wood (chok-e darman) and ancient trees planted on the banks of the Khezr spring (Al-Khidr). ) (tcheshmeh-ye khezr). To reach the tourist site of Khaled Nabi, you have to cross a very beautiful mountain pass which is in itself one of the natural attractions of the region.